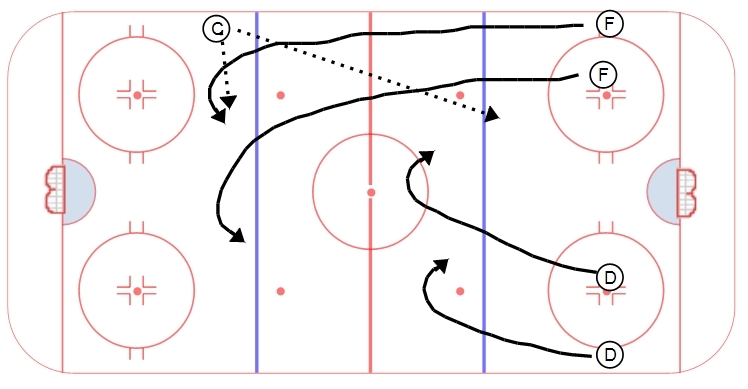 Two on two transition drill today. Two forwards and two D go on a whistle. Forwards head towards the far blue line, D look to gap up. Coach has pucks and can choose whether to give the puck to the forwards for a 2v2 rush, or to give the puck to the defensemen turning the play into a regroup situation and a 2v0 +1 rush the other way. This drill works on play recognition and quick situational transition. Players have to recognize the play, what their options are, and attack accordingly. We use our system of play when running this drill, teaching our defensemen to understand their options with the puck, and our forwards to sprint to the proper neutral zone positioning on a counter attack.